Relieves pain instantly. Protects against rubbing. Heals fast. Stays in place. Compeed® hydrocolloid technology is an active gel with moisture absorbing particles. 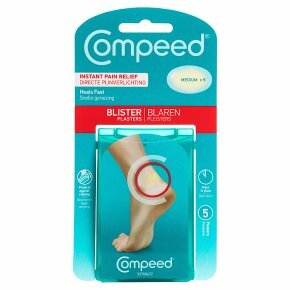 Compeed® plaster acts like a second skin to support the natural moisture balance, to: Relieve blister pain instantly. Protect and cushion against rubbing. Offer fast wound healing. Stays in place for several days. Clean and dry skin before use. Do not touch adhesive side of plaster. Leave in place until it starts to detach. May be up to several days. Diabetics: consult doctor before use. Full instructions and warnings inside.